I'm not especially impressed with most PCs, but one that caught my eye recently was the multimode Lenovo Yoga 2 Pro. Aside from an ultra slim design and gorgeous screen, its main selling point is its multiple orientations – there’s a tent mode, a tablet-like flat mode, a stand mode and a laptop mode, all in one device. 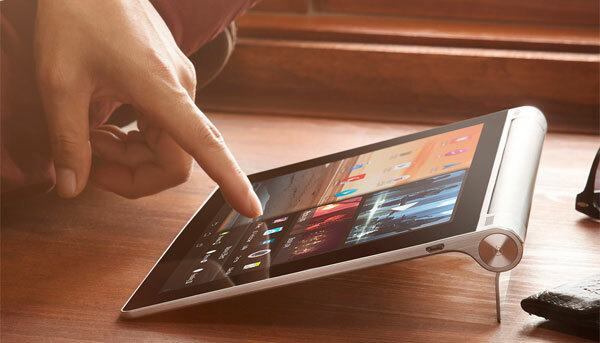 Today, Lenovo announced two new additions to its Yoga line: the new 8- and 10-inch Android Yoga Tablet. Like its laptop cousin, the Yoga Tablet is a multimode device that centers around a cylindrical handle and built-in stand. There’s a self-explanatory hold mode, a stand mode that keeps your device propped at a 110- to 135-degree angle and a tilt mode that lets you maintain a slight angle when laying the tablet on a table. The cylindrical handle isn't just for adjusting the device’s position – it houses a massive 9,000mAh battery that gives the tablet up to 18 hours of battery life. The battery is so powerful, in fact, that the Yoga is capable of charging your smartphone on-the-go via a micro USB port. Both models feature Android 4.2 Jelly Bean, a MediaTek quad-core processor, 16GB of expandable storage, 1280 x 800 displays, Dolby audio, a 5MP rear camera and a 1.6MP front-facing one. They’re also rather lightweight: The 8-inch version weighs 0.88 pounds, while the larger 10-inch tablet comes in at 1.33 pounds. The 8-inch Lenovo Yoga Tablet will be available exclusively at Best Buy and through Lenovo starting October 30 with an MSRP of $249. The larger 10-inch device will be available October 30 at most major retailers with an MSRP of $299. 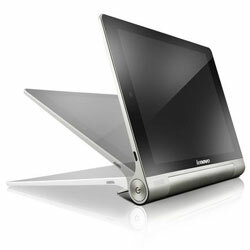 To learn more about or purchase the tablets, visit Lenovo.com.